When Hayley Davies and Stuart Hughes lost their Mum recently following a three-and-a-half year fight with breast cancer they decided to honour her memory by indulging in one of her favourite treats – they arranged a grand afternoon tea event for colleagues and friends at the Pennaf Housing Group headquarters on the St Asaph Business Park. 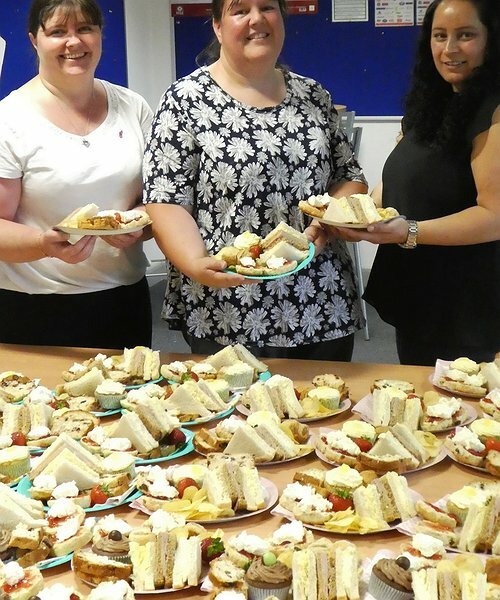 They were joined by Stuart’s partner Kelly, who also works at Pennaf, and a host of other colleagues and friends who helped prepare 63 rounds of sandwiches, 84 scones, dozens of fairy cakes, gallons of whipped cream and more than a hundred strawberries and hundred sausage rolls. “We wanted to do something that we know Mum would have loved, and there was nothing she liked more than getting together with family and friends and enjoying afternoon tea out,” said Hayley. “We were absolutely bowled over by the support of all our colleagues, both at Pennaf and at the Clwyd Alyn Property Services Team who are also based nearby on the Business Park. Hayley and Stuart’s Mum was Mrs Sandra Hughes, of Denbigh, and when they were sorting through some of her clothes they found a Breast Cancer Care token in the pocket of her coat, which she had bought during a trip out to enjoy tea and cakes at Tweedmill in St Asaph. “It was lovely to remember Mum enjoying herself, and that’s when we came up with the idea of an afternoon tea fund-raiser. “A diagnosis of breast cancer can leave you feeling very alone even when you are surrounded by loved ones, and Breast Cancer Care provides a vital role of support through every stage of the illness. “We can’t thank everyone enough for their generosity as well as for their smiles and support. We were also really touched by how many people told us how breast cancer had also affected their loved ones and we realised it was about so much more than our Mum, it was also about supporting everyone who has been affected. There was certainly a lot of love shared as well as a lot of fairy cakes!” added Hayley. "Energy advice at extra care scheme"